Budd Hield scores 19 points and gets four steals to lead the Kings to a win over the Lakers, 84-83. De'Aaron Fox passes to Skal Labissiere for the one-handed slam. Golden State Warriors guard Patrick McCaw injured in scary fall as team beats the Sacramento Kings. Averaged 8.8 ppg (.537 FG%, .375 3pt%, .703 FT%), 4.9 rpg, 0.8 apg, 0.4 bpg, 0.5 spg and 18.5 mpg in 33 games (12 starts) ... As a starter, averaged 11.1 ppg (.500 FG%, .667 3pt%, .680 FT%) 6.0 rpg, 0.9 apg, 0.8 bpg, 0.6 spg and 27.6 mpg in 12 games ... As a reserve, averaged 7.4 ppg (.571 FG%, .200 3pt%, .730 FT%), 4.4 rpg, 0.8 apg, 0.4 spg and 13.4 mpg in 21 games ... Missed 49 games ... Inactive in 25 contests, none due to injury (10/26-10/29/16, 11/1/-11/20/16, 11/27-12/12/16, 12/20-12/23/16, 1/3-1/15/17)... Did not play in 24 games due to coach's decision (10/31-11/3/16, 11/6-11/10/16, 11/23/16, 11/25/16, 12/16/16, 12/26/16, 12/28/16, 1/18/17, 1/21-1/30/17, 2/3-2/6/17, 2/10-2/14/17)... Scored in double-digits 14 times, 20+ points two times and 30+ points one time ... Secured 10+ rebounds in three contests ... Led the team in scoring three times, rebounds four times, and assists once ... Ranked ninth in points per game and fourth in rebounds per game among qualified rookies ... Top Single-Game Performances: Recorded eight points and a career-high 13 boards vs. Charlotte (2/25/17) ... Set a career-high with four blocked shots and added 11 points (5-9 FG, 1-3 FT) and seven rebounds in a win vs. Orlando (3/13/17) ... 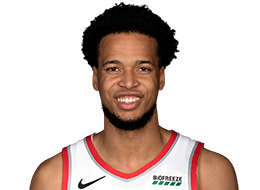 Scored a game and career-high 32 points (11-15 FG, 1-1 3pt, 9-11 FT) with a 21 point fourth quarter and notched career-highs in attempts, makes, and steals with two on his way to his first career double-double in a win at Phoenix (3/15/17) ... Tallied his second career double-double with 10 points and 10 rebounds while adding a career-high eight assists at Golden State (3/24/17) ... Achieved his second career 20+ point game with 25 (10-12 FG, 5-6 FT) to lead the team in scoring for a second consecutive game and tied his career best two steals vs. Houston (4/9/17). Averaged 14.9 ppg (.457 FG%, .167 3pt%, .708 FT%), 7.6 rpg, 0.9 spg, 1.3 bpg and 31.0 mpg in 17 games (17 starts) for the Reno Bighorns, Sacramento's G League affiliate, during the 2016-17 season.